Sly and the Family Stone Greatest Hits is one of my all time favorite albums. It's one I had on vinyl, cassette, CD, and it just now occurs to me that I also need it in digital format for my phone. Every single song on this album just makes me happy. "Everybody is a Star" was written by Sylvester Stewart. This song was released as a B-Side to "Thank You (Falettinme Be Mice Elf Agin)," and it also charted and went to number one on the Billboard charts in 1970. I love the positive message of this song ... it is so uplifting. Here is a 1973 live performance of this song from the old show Midnight Special ... and the performance is amazing. What beautiful voices! Do you like this song? 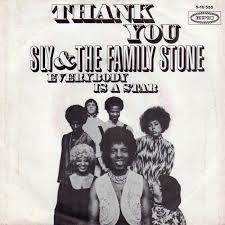 Do you have other favorites by Sly and the Family Stone? I'd love to hear from you in the comments, below. YES to the sparkles and rhinestones. What a fun throwback! I've never heard of Sly and the Family Stone until now! I'll definitely have to check them out. I never knew about this group, but I'm digging your song choice this morning!! Thanks, y'all! I appreciate you stopping by. My Dad used to play this all the time. It brings back such memories. Everyday People is another classic I love. Donnica, I love "Everyday People" too. This music brings back lots of childhood memories for me, too.